Geography is regarded as an interdisciplinary subject without a unified theoretical system, and many of its technical applications and research methods are borrowed from other disciplines. So, how can geography as an independent discipline find its foothold? 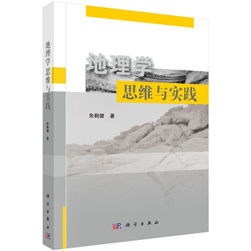 Maybe we can find the answer in The Thinking and Practices of Geography written by Zhu Hejian, a professor of Fujian Normal University and academician of the International Eurasian Academy of Sciences. The “modern geography thinking system” proposed in this book is an ordered collection of geographical concepts, categories and principles. To be more vivid, the book portrays geography as a “geographical person” with flesh and blood: the “central nerves” constructed by human-land relationships along with system and space theory; the “trunk” composed by the inter-connected five geographical schools under the guidance of the central nerves; the “hand” known for its spatial analysis and systematic analysis; and the “foot” based on field investigations and research. On the surface, the main task of geography is to study the interrelations between the various elements of the earth’s surface system, but in fact, the ultimate goal lies in the relationship between the natural environment and humanity. In the mid-20th century, the geographical nihilism demonstrated by the methodology of logical positivism proposed by David Harvey, the master of Western geography, was criticized for ignoring the role of humanity in the geographical environment. Zhu not only pays close attention to the international frontier of geography research, but also shows great concern regarding national practical needs. For 15 years, Zhu has established and managed the coupling test area of agricultural resource systems in Zhangpu, southern Fujian Province, and realized a related increase in agricultural production and farmers’ income, perfecting the coupling theory of agricultural systems. For 11 years, he has implemented an ecological reconstruction demonstration project in mountainous land in Changting, western Fujian Province, and conducted fixed-point observation and tracking. Studying soil and water conservation using a geography paradigm, he fills research gaps on a regional scale. Zhu believes that every Chinese geographer should care about the perpetual survival of the Chinese nation and the sustainable development of this country. Geography requires us not only to study scientific issues, but also to solve practical problems. The dual-disciplinary attribute of geography as “the space science of human activities” requires researchers to have the dual qualities of being both humanistic and scientific.